Professor Stuart Piggott, born in Hampshire, was driven by his avid interest in all things archaeological into an academic career at the forefront of British prehistory. Lacking formal qualifications in the field until the ripe age of 26, Piggott had accrued experiences and expertise that later led him to take up the Abercromby Chair in archaeology at Edinburgh University succeeding Vere Gordon Childe. Piggott worked with O.G.S. Crawford, Sir Mortimer Wheeler, and Alexander Keiller. Before World War II, he excavated at sites such as Avebury and the Sutton Hoo Mound 1 ship burial. 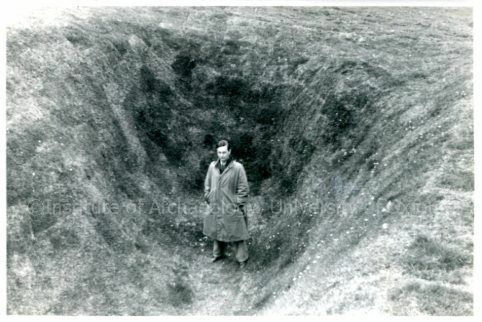 He and his archaeologist wife, Margaret (Peggy), were friends with many prominent artists and writers of the time including John Betjeman, Agatha Christie, John Piper, John Craxton, and Haywood Sumner. During the war he was posted to India. While there, he undertook a trip to Tibet. His observations of Indian and Tibetan archaeology and material culture led him to write ‘Prehistoric India’ (1950). They also strongly influenced his interpretation of European prehistoric archaeology. His archive encompasses witty personal correspondence, notes, research, artwork, and personal mementos relating to his life (1910-1996), including excavation notes on British prehistoric sites, travel notes on Tibet and India, art and poetry. Also included is a stunning collection of images of pre-war British architecture and heritage sites, and of Tibet and India in 1942-3. Glad you enjoyed the post. The School of Archaeology holds the Piggott Archive, including some letters from Sumner. The archive isn’t available online yet, but we’re looking at ways to raise money to catalogue and digitize it.